The Judicial Committee of the Privy Council (JCPC) signifies different things to different people. It is both a court and an advisory body. It rules on disputes ranging from the personal, such as the inheritance of a hereditary title amid accusations of historic infidelity, to those of great public importance, such as the validity of elections, or significant commercially, such as the ownership or control of Turkey’s largest mobile phone company. It renders advice to a Queen and a Sultan and sits as the final court for 30 overseas jurisdictions, including three republics. It is at the same time an anachronism and a functioning part of many modern systems of justice. For some it is a hanging court, and for others an upholder of human rights. In short, it is a conundrum. For a start, today the JCPC can be distinguished from the Privy Council, which maintains a largely symbolic role as a mechanism for giving effect to certain governmental decisions in the fields of domestic and foreign affairs. The Privy Council featured in the news when Labour Leader Jeremy Corbyn allegedly declined to attend the traditional ceremony where new members kneel before the Queen and kiss her hand when accepting the oath of allegiance. Though now separate, the JCPC and Privy Council were originally the same body. From at least the 11th century, the Privy Council performed a vital role in the government of England, not just as an advisor to the Crown but also as a legislator and a court. The Council was formed from the King’s most trusted and powerful advisors, though as anyone who has read Shakespeare’s histories will appreciate, the two were not always the same thing. Today the JCPC can be distinguished from the Privy Council, which maintains a largely symbolic role as a mechanism for giving effect to certain governmental decisions in the fields of domestic and foreign affairs. Ironically, the Privy Council first began to hear judicial appeals from overseas territories not, as one might expect, as a result of England conquering another nation, but rather by England being conquered. The Duke of Normandy also ruled the Channel Islands, and their citizens were able to appeal to his mercy. When William of Normandy ascended the throne in 1066 becoming William I of England, this right of appeal became vested in English Kings and Queens. In the 1830s, the JCPC had become unmanageable. Henry Brougham, a Scottish advocate, anti-slavery campaigner and fiery Parliamentarian, took it upon himself to push for change. The Privy Council Acts of 1833 and 1844 carved out the JCPC from the Privy Council. They transformed the JCPC from an ad hoc committee sitting as little as twice a year, whose members could include non-lawyers ranging from politicians to bishops, to a professional court staffed only by senior judges. Today the JCPC hears appeals from 30 overseas countries and territories, from the inhospitable and sparsely populated British Antarctic Territory to the vibrant and diverse: Jamaica, Jersey, Guernsey and the British Virgin Islands. Its long history and varied jurisdictions have allowed it to hear a fascinating combination of cases. These included an appeal in the 19th century from Hindu leaders in India against the ban on the practice where widows were compelled to jump on to the funeral pyres of their husbands. Notable appeals in the 20th century included a challenge to the lawfulness of British controls on immigration to Palestine by European Jews. Today, as a constitutional court, the JCPC contributes, with other supra-national or international tribunals, to the development of fundamental principles associated with the rule of law and individual liberties. The death sentence in some of its jurisdictions still regularly raises issues for determination. As a commercial court, the JCPC aims to secure certainty and consistency among its jurisdictions, which include several offshore financial centres. This has been illustrated most recently in a series of cases involving innocent victims of Bernie Madoff’s Ponzi operation. The JCPC’s lesser-known domestic jurisdictions include disciplinary appeals for vets, disputes over parish boundaries, and even the distribution of bounty in the event that a foreign ship is captured (though this hasn’t been invoked since the Second World War). Before 2017, the last practitioner guide to the JCPC was published in 1937 and written by Norman Bentwich, a former Attorney General of Palestine who once survived an assassination attempt. Perhaps the lack of updates in the past 80 years is because of an impression that the JCPC is soon to be abolished. But rumours of its death may have been premature. The JCPC is ancient, but it isn’t stagnant. In 2016 it was decided for the first time that a JCPC judgment could formally bind English Courts on questions of English law, despite being outside the English legal system. 2016 was the first occasion JCPC and Supreme Court also sat together as a single body to hear two appeals concerning joint enterprise liability in both England and Jamaica. It has embraced modern technology including broadcasting judgments on YouTube. Dean Acheson, the former US Secretary of State, commented in 1962 that “Great Britain has lost an Empire and has not yet found a role.” With Britain’s impending exit from the EU, the same could be said today, as Britain once again considers its place in the world. However, after all the turmoil of the past thousand years, the JCPC has continued to exist as an arbiter of justice, applying and developing the law across and within its jurisdictions in accordance with local circumstances, as well as international norms. Its jurisprudence both influences and is influenced by that of the UK. For so long as the JCPC remains the constitutionally-prescribed final court of appeal for any country or territory, it has indicated both willingness and determination to serve that jurisdiction and its people as best it can. Featured image credit: UK Supreme Court by Shark Attacks. CC BY 2.0 via Flickr. Lord Mance is Deputy President of the Supreme Court. He served previously as a Justice of the Supreme Court, and as a High Court judge in the Queen's Bench Division, where he also sat in the Commercial Court. He was appointed a Lord Justice of Appeal in 1999 and has sat as a judge on the JCPC for over 10 years. Jacob Turner is a barrister. He has represented sovereign States and corporations in commercial, human rights, and public international law disputes. Jacob was formerly the Judicial Assistant to Lord Mance, in which capacity he assisted with the preparation of various judgments. 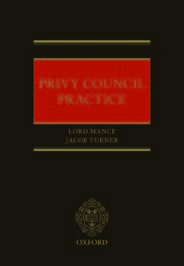 Together, they are the authors of Privy Council Practice, published by Oxford University Press.